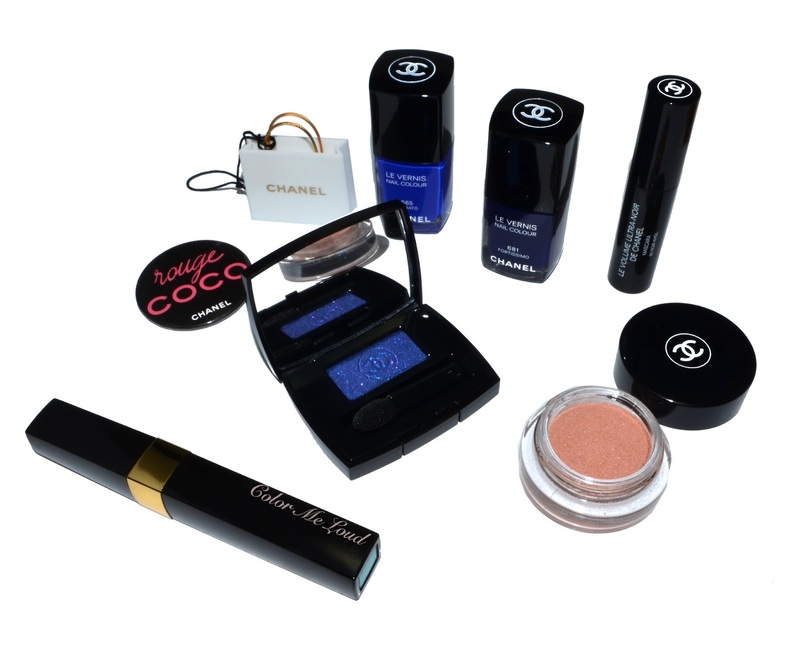 Before I start, it is so sad that Lisa Eldridge doesn't make Chanel Collection videos anymore. I watched one that they did with the model and it is so funny. She almost has no application skills and the eye make-up gets very patchy in the beginning then magically it is fixed. She is wearing a liner on the first scene and reapplies it for whatever reason again. Then she puts on Swing two times with the same argument "to bring dimension". Oh and not to mention she applies the crease makeup with layering brush and makes a line around the crease with liner brush. Here is the video if you would like to see yourself. That said Melody doesn't show up on me since it is almost the same as my skin tone. I can use it as a base though which I did under Swing for the look here. If you are fairer or deeper than me, you might like it more. Now for the star of the collection after the nail polishes is... *drums* Look at this mascara! I wouldn't even try it out because all my colored mascaras dried out before I could use them at least 2-3 times. But this one is really exceptionally beautiful. I saw it on the lashes of SA and I was like "what is this on your lashes?" haha this was the last thing I asked before the purchase. I want to try to apply it as eye shadow too. I think it would look nice. I am really not crazy for that non blended, q-tip look in the promo so I am adding a touch of MAC Omega to blend out over the crease. 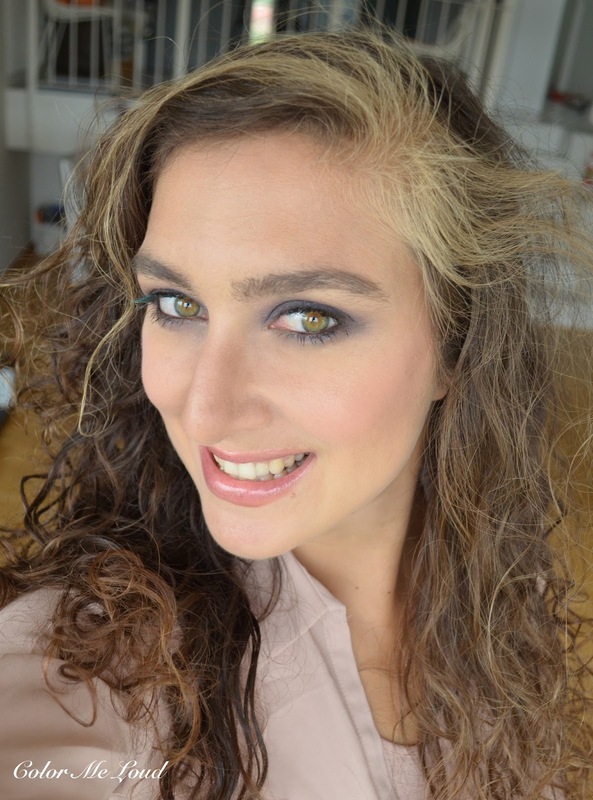 I am wearing Illusion d'Ombre Velvet Melody as a base under Chanel Ombre Essentielle #116 Swing and Cils Scintillants Jazzy Blue on the tips after applying black mascara. Now there is an ultra black Le Volume Mascara. I was given a sample of that but I want to wait until I am finished testing a few other mascaras so here I am wearing the regular Black Le Volume. Notes about Swing, it applies much more than I anticipated since there were mixed reviews about it. The shimmer doesn't look so crazy on the lids either so I like the formula. I didn't get the gloss because right now I am enjoying Estée Lauder Pure Color Envy Lip Volumizer which is similar but have a pink tingle which I prefer. In the photo below I am wearing that one, review is coming up soon. All in all which music fan can resist a collection named after jazz and music? I couldn't. 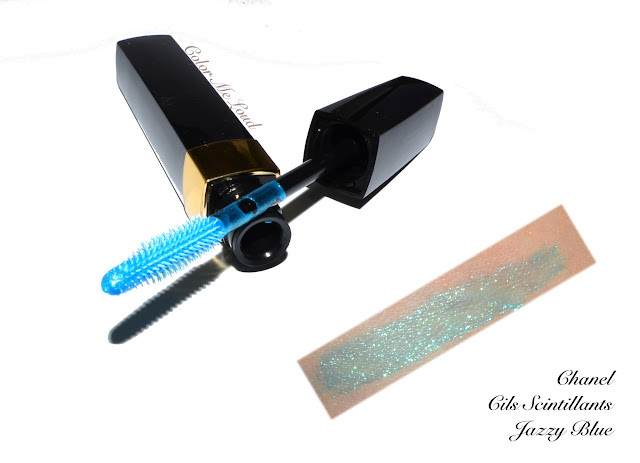 My favorite items are Cils Scintillants Jazzy Blue and Le Volume Vibrato nail polish. Oh and we still didn't get the fall collection, can you believe? 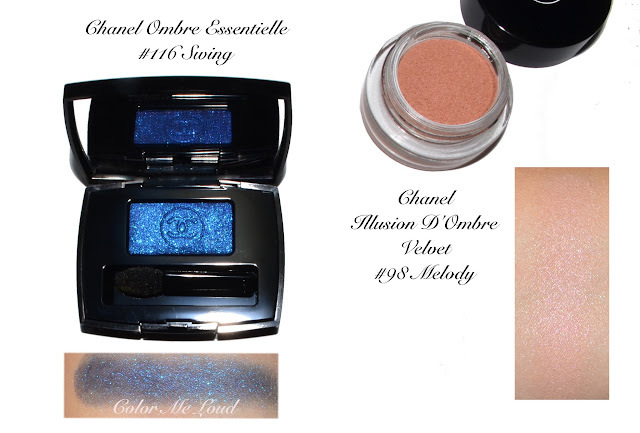 Check out more Chanel Blue Rhythm Collection swatches at Silverkis and Mostly Sunny. Final thoughts: Chanel Ombre Essentielle #116 Swing was probably a crazy impuls buy but it was too pretty to pass. I hope Cils Scintillants Jazzy Blue doesn't dry out quickly because it gives that little bit of something to otherwise boring looks without getting cheap looking. Love it so much. If your skin tone is close to mine Illusion d'Ombre #98 Melody will probably not show up on you. Have you picked anything from this collection? Do you like wearing blues on the eyes? The mascara is really interesting. I remember when Sunny reviewed it also. The colour is not that particularly appealing to me personally, but it would be cool if they brought out a few other shades. I'd love to see a purple. I think Clinique (?) are doing some kind of coloured mascara's at the moment also. Reading your description, I don't know if I even want to watch the video. LOL. Sounds so embarrassing! Bonne journée, plus calme qu'hier j'espère ! I bought Melody,Tisse Jazz,Jazzy Blue Coat, Perle De Lune stylo yeux( since I never got my hands at la Perle Collection here in Sweden) and the 2 polishes! And yes here the fall collection arrives mid of October! Your eye look is eqxuisite. Seriously. The video is hilarious!!!! I love the glittery mascara, but that's the only piece i picked up as I was very busy with their autumn collection :). Thanks for the review! Melody didn't show up on me either, so I passed. I love Jazzy Blue and am also hoping it doesn't dry out quickly! I'm optimistic, however, since I have Bronze Platine from the 2013 holiday collection and it still hasn't dried out. The formula doesn't seem super dry. Ah, I love blue shadow on you, Sara!! I have a few blue eye shadows but I never seem to wear them at all. I tend to stick to boring neutrals :-) And LOL at your observation on the Chanel videos. Lisa does rock and she's been doing lots of Lancome videos. How pretty is that mascara! Love the look you created. I went to pick up Melody but when I swatched it I could barely see it, wondering if it might show up better on the lid though. Mascara was definitely the unexpected gem of the collection. I posted a photo of Melody and some of the readers with a deeper skin tone said she loves it. Probably it is not for fair or light ladies because it gets lost. Chanel should get another Make-up Artist to do the videos. Their model looks like she never applied make-up on herself hahaha. I now started wondering on whom did this eye shadow show up hahah. I have a few mascaras from 2 years ago (summer collection) and although they are usable, they make some fall out due to dryness during the day. I am hoping this one has a more jelly consistency. It looks like the model never applied eye liner nor eye shadow on herself. I also very rarely use colored mascara but this one gives a magical effect on your regular mascara without being too obvious. Especially under sun light or store light, it is so gorgeous. I think I will somehow get the holiday collection from US at the time Fall collection reaches here. I would like to get the red Rouge Coco Shine from Fall Collection but my desire started to get cooled down since it will be winter here by the time the pieces arrive. I would love to write a few articles about music, I don"t think I will have lots of time to start another blog though. Do you think people would read an article about music here? I doubt lol. Ohhh why don"t you have the blush? Is it because Fall Collection didn't make it here yet or is the blush won't be arriving to France? I can get it for you if it is the case. We didn't receive the Fall collection yet either. I haven't tried using it as an eye shadow yet but I will. It is just hard to get some product out to apply on the lid lol. 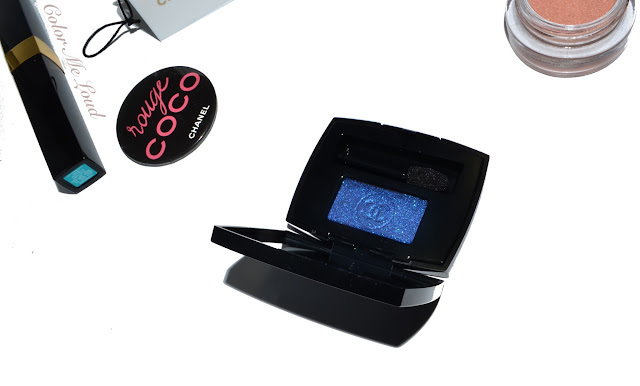 I may try to get just a tiny bit on another eye shadow just to put some sheen as you described. Video is hilarious hahaha everyone should watch! thanks, I feel like it makes my eyes look yellow lol so I am not sure if I like the effect all that much. Sea foam! Yes! Exactly!!! I hope it doesn't get dry until summer lol. Purple version of that mascara and I die!! I will check Clinique ones, I haven't heard of them but the formula of this one is so unique (like a gel) and the sheen is so pretty. LOL, right, hilarious video. I have to admit I watched it a few more times just to laugh. Hi Sara, I missed all your news and need to read up :) I like Swing a lot, but wear it in a color scheme that dior/cle de peau/by terry suggested - add it over Dior Ambre Nuit, Chanel Charming or Tisse Rivoli with a sponge, as a thick stroke in outer corners. At the end of the day it makes a more contrasting look than just something brown-bronze. Swing applies as intense as in a pan. Combined with Dior Meteore and Guerlain Fauve monos also worked for a day, something like Suqqu ex-26 but more suitable for me. I also want to try it with light pink eyeshadows, Suqqu used to have such combination with dark blue in some of their LEs. As for the collections, it became my airport entertainment - going to the duty-free shops to check whether they have Blue Rhythm collection or the Fall one. Based on the 5 or 6 airports that I have been to this month, it is a random disyinchronized mess. Such a waste of advertising budget and our patience.I bought both collections, exc. mascaras (don't need) and Entrelacs (sold out!). That's interesting. Perhaps, people who read fashion bloggers buy less makeup and are more interesting to reach than those who already know it all from reading beauty blogs. Either way, Lancome has some really good mono eyeshadows, one favorite mascara, a couple of nice everyday lipstick colors and that's basically it. You haven't lost much :) Their big palettes come out so-so and quints have mediocre texture (does anyone in this world buy them? ).